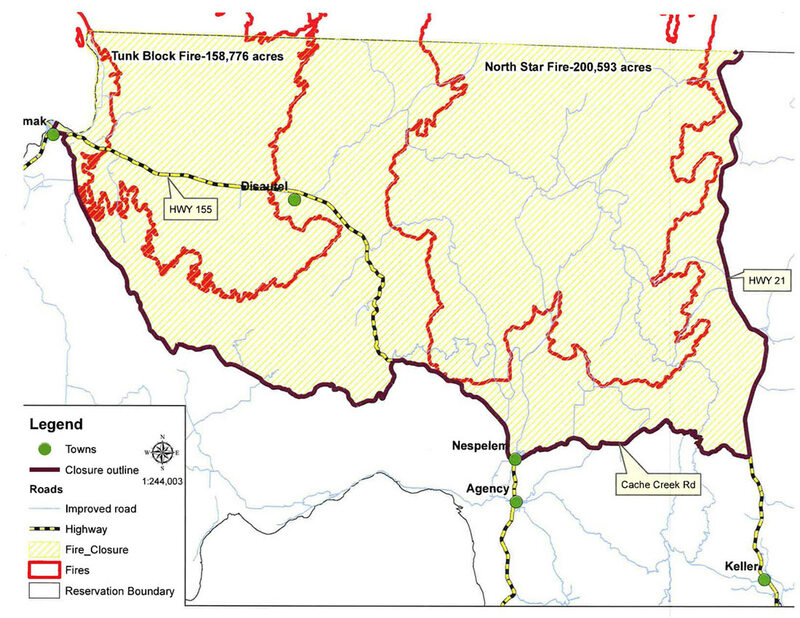 This map from the fire blog site shows the areas closed and open on the Colville Reservation. Click to enlarge. Fire crews are gaining on the fires with help from the weather and more resources, including troops, who were visited by a four-star general this week. On Monday, Interior Dept. Secretary Sally Jewel will visit the North Star Fire as the administration proposes changes to the way wildland fire fighting is funded in the nation. "Fire seasons are becoming longer and more intense," Interior stated in a press release announcing the visit. "The Obama Administration has called for a new funding framework that would treat wildfires similar to other natural disasters. The budget proposal would provide greater certainty in addressing growing fire suppression needs while preserving funds meant for prevention and other non-suppression programs, such as fuels reduction and post-fire rehabilitation." Large portions of Tunk Block are in mop-up status, as is the southern boundary of the North Star Fire. The Colville Business Council reopened much of the reservation Sept. 1. The portion south of highway 155 and Cache Creek Road, and east of highway 21 have been re-opened. Yesterday's Activities: Crews continued a burn-out along the northeast corner of the North Star Fire to better protect the Republic community. Another burnout was successfully implemented at the eastern end of Aeneas Valley, and one was initiated between the fire and a portion of Hwy 21 to protect houses in that corridor. Hand and dozer lines to control fire spread continued to be constructed along the southwest and west portions of the North Star Fire, and the north part of the east boundary of the Tunk Block Fire (NE Tunk Mountain). A large portion of the Tunk Block Fire and the southern edge of the North Star fire are in mop-up and patrol. Today's Operations: Crews will continue burnout in portions of the Hwy 21 corridor as conditions allow. Fireline construction and mop-up will continue. Work continues on the contingency line northeast of Tunk Mountain to better protect private land and homes in Aeneas Valley, and the lookout. Firefighters are coordinating with range permittees in preparation for a potential burnout between constructed line and the fire's edge. Aerial resources are checking the spread of the fire as line construction continues. Scattered smoke will continue to be visible on both fires, including some from burnout operations. More resources are becoming available to manage the North Star Fire, including some being transferred from the Tunk Block Fire. Crews working night shifts will change to swing shifts noon to midnight to better manage more active fire periods. Weather: The forecast is for continued cool and mostly cloudy with isolated showers through the weekend. Maximum temperatures 60-65 at higher elevations and 65-72 in the valleys. Relative humidity will be 25-35%. Northeast winds will shift to northwest by afternoon. Benefit of fuel treatments: The forest thinning and fuels treatments in the south and east forested edges of Aeneas Valley modified fire behavior, slowing its spread as well as facilitating burnouts and allowing firefighters to establish effective containment lines that protected homes and land. Evacuations/Closure Information: Evacuation and closure information is dynamic and changes more frequently than this report is updated. For the most current evacuation information, please contact your closest Emergency Operations Center (EOC): Colville Tribal Emergency Services 509-634-2105, Okanogan County EOC (509) 422-7206, Ferry County EOC 509-775-3132. Highway closure information is available online: http://www.wsdot.com/traffic/trafficalerts . National Forest Lands east of Tonasket and south of Highway 20 on the Tonasket Ranger District are closed. Colville Indian Reservation forest and recreational areas are closed within the fires.